The idea for this round is pretty simple: a sniper rifle. If you've ever played a shoot-em-up, you know what we're talking about. A rifle with a scope mounted on it. You zoom in on your target and with one shot you kill. There are a few rules here though. Your final entry should consist of both a side view of the gun and a view as if you were the gunner holding the weapon. That is how you see the weapon in the game, so it should look good from that angle above all. As for style, in most shooters you play either a human against aliens or the other way around, so don't limit yourself to only human army type guns. 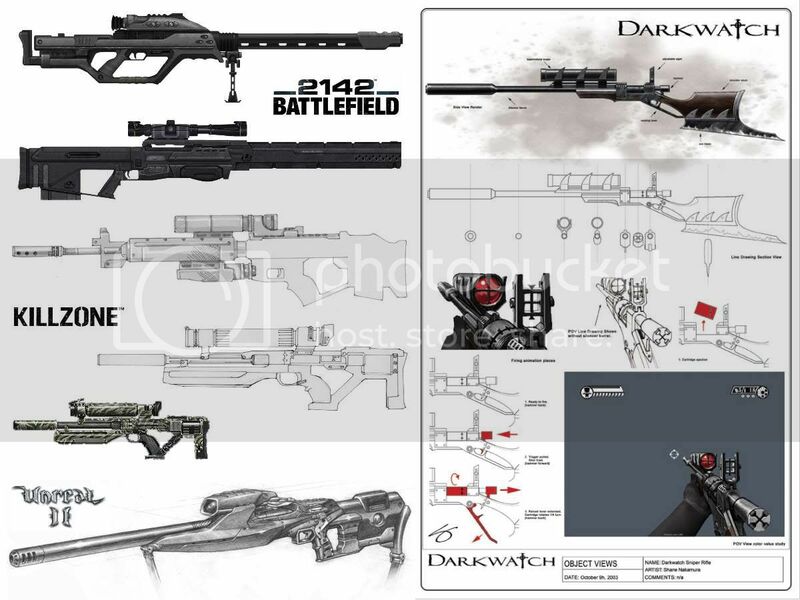 The rifle should fulfill the role of a sniper rifle, but can take on whatever form or shape you like. 1. 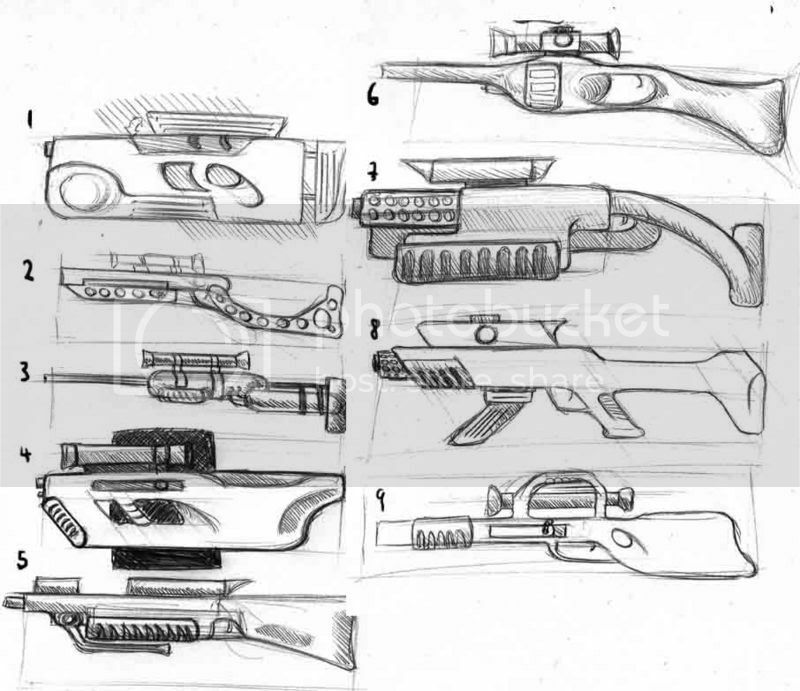 Draw and design a sniper rifle. 2. Your final entry should consist of both a side view of the gun and a first person perspective view, much like you would see it as in a game. Man I was thinking about take a week off to attend another business but I can't with this topic coming up. Well if you wanted to work as a concept artist at a game company you probably would. lol. when you say first person view, do you mean as if when your character is running around but you can still see your hands holding the gun or when your actualy in sniper mode, looking through the actual scope itself? The first-person view is a little intimidating, but I guess the point is to get out of our comfort zones eh? For such an alluring topic though I'll try to give it a shot again, especially since I didn't have much time on the last one. here is just an hour of off and on brain storming! Some interesting ones among the lot, Legato! I'm looking forward to see what you narrow down on. Yoitisi, quick question. Would a full-on, centered rear view work for the first-person view? Since sniper rifles are usually fired prone, it's close to what you'd see. And it's a bit less awkward than having to draw in hands, working out the slight angle, etc. You know, for those of us who are still perspective-challenged. Legato - #6 and #9 seem to hold something special imo. Form2function-However, if you are trying to replicate a FPS view or how concept would be done to test the silouhette of a gun in that kind of game then the angle is all important...otherwise it won't read right in a game. I know it's tough but isn't part of this forum to challenge yourself and learn new things...especially new things that are industry standard. 2 cents. 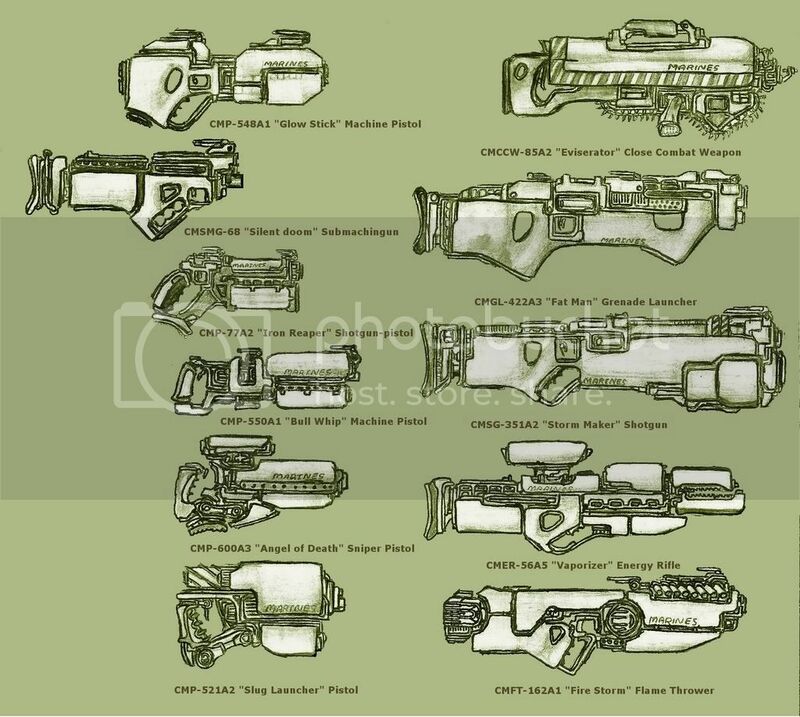 Form2function and actually all: Here are some examples of conceptdrawings for guns from various shoot-em-ups, including Gears of War and Unreal Tournament (I don't know the names of the artists, if someone knows tell us and I'll put them in this post). Hope they help, as they show what I expect of you to draw. As an afterthought, I believe the first one is drawn on top of a 3d model, and the last one is a 3d model. If people feel the need to make a 3d model for this round I'm fine with that, but at least one of the 2 images (side or 3/4 view) must be an actual drawing and match the 3d model. 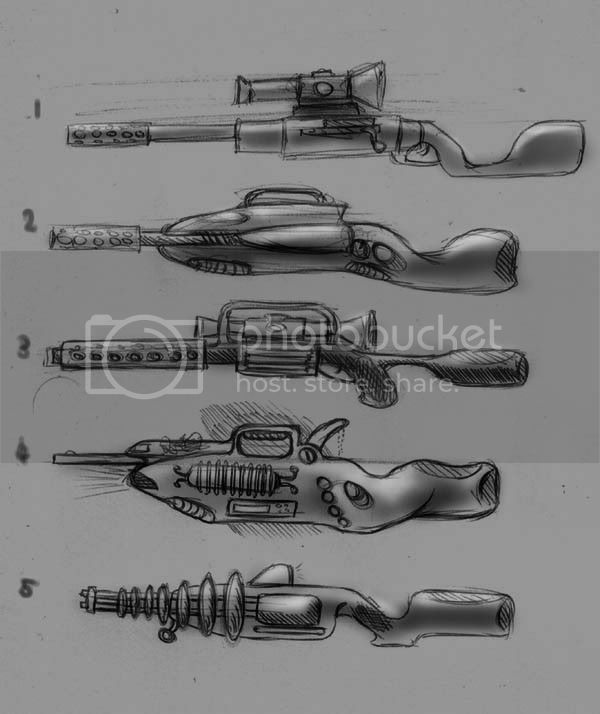 Edit: Apart from the Strogg gun, which was drawn by Arnie Swekel at Raven, all of these are drawn by James Hawkins at Epic Games. Thanks for providing the names, Epias and Brian h.
Last edited by yoitisi; November 28th, 2007 at 12:04 PM. Last edited by RandAlThor; November 28th, 2007 at 02:41 PM. Yoitisi, thanks for the clarification. The 3D issue would have been my next question. Don't think I'll have the time to do a fully textured render, nor sure I'd want to, but I'll definitely need to do a rough blocking out to get the perspective right at that angle. Yours looks pretty good as well. But... It seems a little short for a rifle, no? Or was it just a handgun/carbine and it gave you the idea for the rifle? Either way thanks for sharing it even if you don't end up working on an entry. Legato, 17 does look good. Can tell you like it most from the attention you paid to the sketch. It reminds me of the PAX stuff you did a while back, particularly the revolver cylinder. Always fun to revisit old ideas though. RandAlThor there's some cool ideas in there. I hope you find the time to work on a final, I'd love to see what you end up with. *EDIT* can side view mean... kinda side view?... like i have towards the end, where its perspective but at a really shallow angle? Last edited by Legato; November 28th, 2007 at 10:56 AM. 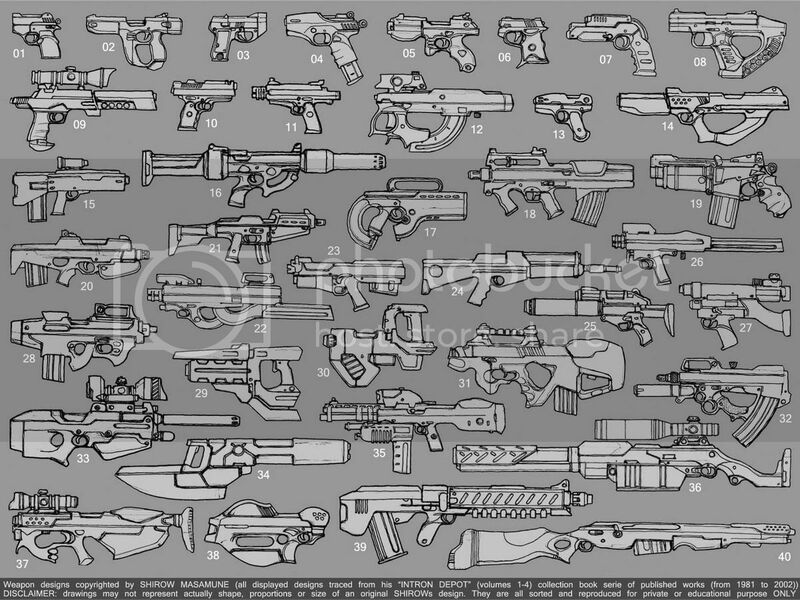 In the interest of full disclosure...and much need respect...the Strogg gun above was designed and drawn by Arnie Swekel at Raven...the rest were James Hawkins at Epic. heres what i got so far, hopefully i can finish this one, anyway its basicly something i thought might be suitable for a similer character i'm doing for this weeks chow. modern yet primetive, in a similer way to the harpoon gun used in the aliens vs predator games. Only this version will have 2 spear like projectiles connected to each other, so acting like a slicing weapon. Good stuff there Grenogs! So the two spears have some sort of blade or thin razor-sharp wire between them, and that's what slices? I definitely like it, particularly the simplicity of the design. I was thinking of taking the crossbow-type approach as well originally, but I'm glad I didn't. You're doing it more justice than I would. Edit: Afterthought. If that's the case and they're connected with the cutting part, then I would suggest setting them on a slight arc instead of running parallel. So that once projected they travel a bit from each other and the target doesn't have to fit between that little narrow part between them. Right now you'd have to pretty much target the neck or appendage to use the slice part of it. Unless I'm completely off my mark on how it works. yeah the design of the spears aren't totally worked out, i was thinking as its supose to be for a game, then the reality of the mechanics dont realy need to come into it, becouse in games anything posible. But otherwise i was thinking the projectile at moment is at birds eye view, so basicly the the 2 spear parts would fit into two runners, much in a similer way a train does on tracks, the slicing part would probably be a flat piece of metal, which at the same time would also act as a connection bit in a similer way to how a bolt is connected and fired from a crossbow. Though im thinking unlike a crossbow, this weapon would probably use a form of compressed gas technology for a much higher power. My other major problem if this was for a realistic weapon is, how do i stop a reasonably flat projectile from spinning uncontrolably. Disclaimer: Forgive me if I'm stepping on toes or breaking protocol or anything. I know many, myself included, usually prefer to work out issues on their own. But since the idea is to offer crit, feedback, and ideas to help each other out, I don't think I'm off the mark. Now then. Since a picture's worth a thousand words, below is what I mean about the width. How wide you make it is completely subjective, as is making it at all, but I wanted to illustrate the point. If they were just piercing, it wouldn't matter. But for the blade to be of any practical use, it needs to be long enough to cover some meat. My other major problem if this was for a realistic weapon is, how do i stop a reasonably flat projectile from spinning uncontrolably. Not exactly an aerodynamics major, but I believe it's a combination of propulsion and surface. You'd need enough flat surface with some slight volume to give it flow and then enough propulsion to push it in a linear direction. Spin is mainly controlled by the shape. 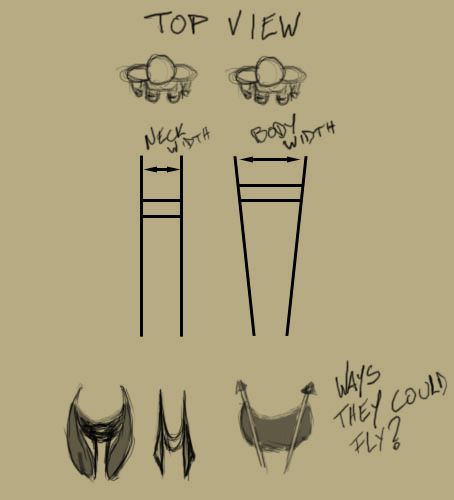 I sketched a few simple ideas of what I mean, just to illustrate the point. The main thing you have to work with is that middle blade, since the spears have little to no surface volume unless you flatten them out (as I did in the first two sketches). Anyway. I hope this helps and gives you some ideas. I'm definitely looking forward to seeing the finished piece. Now back to working on mine.